For years we've taken the pumpkins to local schools. It really makes all of the hard work worthwhile, because anyone who is a child at heart appreciates a giant pumpkin. The questions and the level and enthusiasm are always the same. "How much does it way?" "How to you lift it?" "How many pumpkin pies can you make?" "What will you do with it?" Matt McConkie said it well on TV. I challenge you to see a giant pumpkin and not smile. One of my favorites is driving the pumpkin around and watching people at the side of the road light up when they see the pumpkin. To answer the last child's question about what we will do with this pumpkin? One will be on our driveway for Halloween, so make sure to stop by if you are trick or treating in Midway. The other pumpkin will be at Signam Signs in Midway. 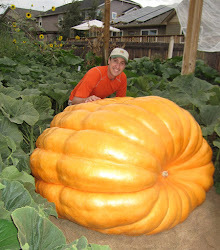 Both are the biggest pumpkins ever grown in the Heber Valley, so they are kind of fun.